Please help Olly by sharing his page! 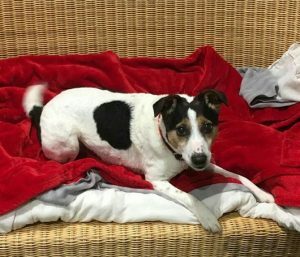 Playful little Olly is a 7 year old Jack Russell Terrier in the care of a foster home for Dogs Trust Newbury in Berkshire. Olly is shy when he first meets people but once he knows you, he likes a fuss. He will need to meet his new people a few times before going home with them, so you will need to be able to do multiple visits. He wants to be an only pet in an adult only home, where someone will be around most of the time. He loves company almost as much as he loves toys! Olly has good manners and is very bright, so he’s highly trainable. He’ll happily learn anything if treat and praise are on offer! 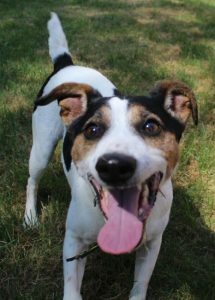 Olly is a typical JRT with lots of energy and enthusiasm. He loves his walkies but being middle aged, he does like his nap times too! Playing with toys is Olly’s real passion. Anything he can shake, rag or play tug with makes him very happy! 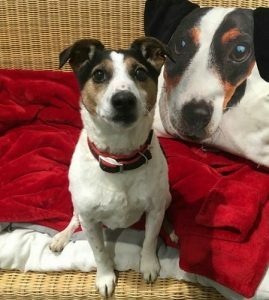 Olly is a wonderfully fun companion who will keep you entertained. 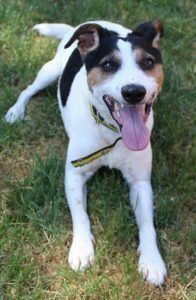 Due to his initial shyness, he needs an owner who can come to visit him a few times to build up a rapport before adoption. He’ll need time to settle in as well. He’s worth the effort as he’s such a joy to be with! 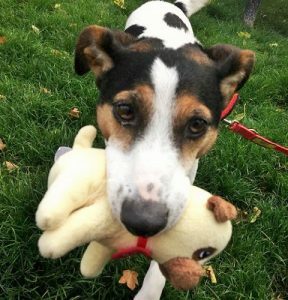 Ollie is not at the rehoming centre – you need to phone if you are interested in meeting him. Please say you saw Olly featured on the Oldies Club website. This replaces Olly’s original page dated 1st August 2018.